This entry was posted on Friday, September 17th, 2010 at 12:55 am and is filed under News. You can follow any responses to this entry through the RSS 2.0 feed. You can leave a response, or trackback from your own site. This is huge! Mass refunds are coming! this undermines all of justice. what a shame. As practiced from the 11th to 20th centuries in Western societies, a duel is an engagement in combat between two individuals, with matched weapons in accordance with their combat doctrines. Who was the process server and the process serving agency? Maybe everyone is aware of this, but all the Justice Courts and City Court Judges accept some form of digital signatures on affidavits. All of them. In addition, the Judges themselves do not review every piece of paper before a “Clerk” of that Court stamps the Judges signature. Many of the signature processes are streamlined. Mistakes are made all the time. Courts have to correct mistakes all the time. As well, Amended affidavits are filed all time. I have an interesting question… about 5 months ago I received a ticket in the mail from DPS and ignored it. Following that I received a second copy. Now about a month or so ago, while I was at work, a process server showed up at my house and rang the bell. My 14-year-old nephew opened the door (leaving the screen door closed and locked). The woman asked if I was home he replied “no” and she slid the papers under the screen door and asked that he give the papers to me and asked for his name. At that time my niece, who is 15, came to the door and was asked her name. Neither on gave their names, the processor said thanks and left. Now my question is, was that a proper service? I have read in several places that the servers cannot serve anyone that is under the age of 18. It also states on the notice that if I do not pay the account will be turned over to a collection agency. Can this be done? If it does appear on my credit report how do I go about challenging it? The first mistake was answering the door. Once a process server speaks to someone who lives with you, assuming these individuals live with you, they can serve anyone living with you who is of suitable age and discretion. The phrase “suitable age and discretion” does not define an age, however, if the person being served on your behalf is at least 14 years of age, the service usually stands up in court. Your niece essentially confirmed that you lived at the residence by saying you were not home at the time. Also, there is no requirement to have a name if the person being served refuses to give a name. Your second mistake was not challenging the service. You essentially forfeited your right to challenge the service by defaulting. Your best bet is to consult with an attorney. Preferably one familiar with photo enforcement. Best wishes and better luck next time!! Got a ticket apparently on 29 May. Did not waive my right to be properly served so assuming I’ll get served. Nothing yet and we’re coming up on 4 mos. 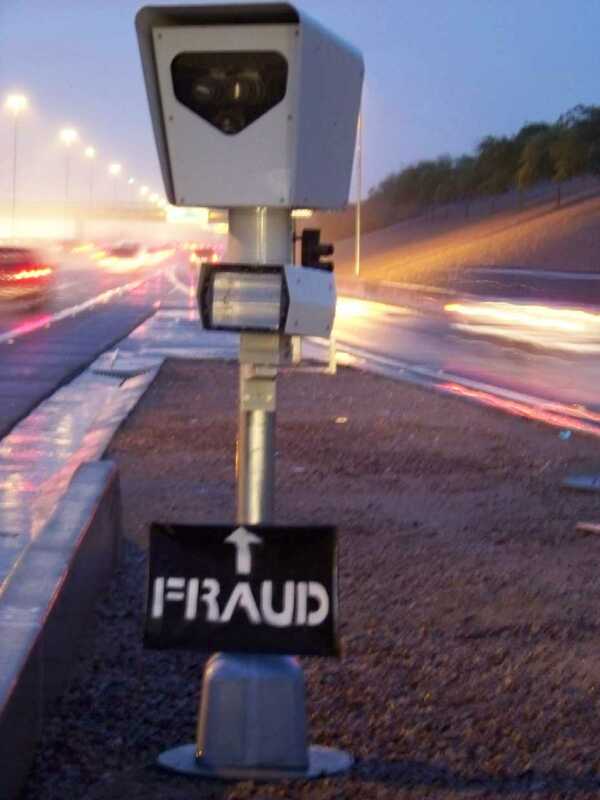 What’s the statute for serving these and are they cancelling the process now that the freeway cams are down? (You know – I used to support these but after I got hit – in traffic and going the flow AND being passed – I realized that so many normal drivers who don’t make a habit of speeding unsafely – are unfairly getting tagged too.) Thanks for the work on this. Phil, could you say that last part a little louder so the “If you don’t speed you have nothing to worry about” crowd hears you? I believe the state (and their buddies Redflex) have 120 days from the date of the alleged violation to issue a complaint. If a complaint is issued, the state (and their buddies at Redlfex and the process servers) have 90 days from the date of issue to serve you. Check the Maricopa County Court web site to see if there is a notice of violation in your name. Check the JP site. ok I have a question for those who may know what to do. I never received the citation in the mail to even know to dodge not that I would as my car had been off road since june due to a broken waterpump. at the end of June I received a letter stating there had been a default judgment against me and my licence may be suspended. I called that following monday to see what was going on found out it was a red light arrow violation from July 11th ( my daughters birthday weekend we were with friends in Cally) and a process server had delivered a citation to a 6 foot male and yes my car was in the drive way on lifts as it was going to be finally fixed that thursday (actually was finished Friday) Now my question is WHO WAS THE MALE HE DELIVERED TO we were not home it was labor day we were about 150 miles away camping at hot springs north of Phx. I sent a letter to the judge and he set a court date for the 5th of NOV what and how do I start anything such as write up a motion to dismiss due to improper service or a petition for proof of service as I am handicapped and have no way to get to the court.